Whether your kids share a room by choice (yours or theirs) or by necessity, the experience won’t be without struggle from time to time. Even kids who chose to share a room will get into fights as a result of sharing a space together. However, sharing a room can be a valuable experience. At it’s best, it will bring your kids closer together, and at the very least it will teach them to compromise. The trick is learning how to handle the stressful moments that may arise as a result of the rooming situation. With that, let’s talk about some strategies to make sharing a room a smoother experience for your kids — and more manageable for you! Siblings don’t always like to share their personal possessions with each other (although in an ideal world, this would be great). I would recommend laying down which area of space in the bedroom belongs to which child as soon as possible as a solution. If you are able to redecorate the room, this can be a great opportunity to involve them both in selecting the color scheme, furniture and accessories. Ensure they have a cabinet or shelf that they can personalize whether with stickers or with items that are valuable to them such as trophies or books. They can also be involved in choosing their own bed linens as this will make the experience more fun and reassuring for them. This way their space will be more defined and fewer arguments are likely to occur. The other side of the coin is when your kids get on so well they won’t stop chatting and laughing when bedtime comes around! While this is warm and delightful to hear as a parent, it is very impractical if they are supposed to be getting to sleep, particularly if they have school or an important event the next day. One way around this, especially if your kids are different ages, is to stagger their bedtimes. Hopefully the oldest child can then be put to bed when the youngest child is asleep. If they are similar in age or twins and you don’t feel it is a good decision to stagger their bedtimes you can instate a mock bedtime where they can talk to their heart’s content and get it out of their system. This mock bedtime could be about 30 minutes before the lights have to go out, but it is best to be strict that at this point there should be no noise. I would also suggest being cautious about what food and drinks they have right before bed as certain foods can make it more difficult for kids to wind down. If sharing a room is a new experience for your kids, you may find one or both of them will use this situation to try and get your attention, especially if you are preparing for your “me time” after a stressful day. Kids tend to know exactly when and how to push your buttons from a very early age! Although it is hard, it is actually best if you can ignore the arguing or other tactics your kids may use to try to get your attention. The trouble is, the more you give in, the more they will act out. As long as you know they are safe (if leaving them makes you feel particularly insecure, you could always invest in a video-monitor), try to ignore their behavior, even if this means turning the TV up a notch. You may feel guilty doing so, but it’s surprising how well siblings can sensibly sort things out between themselves if they are left to their own devices for long enough. If your kids do genuinely find it hard to relax enough in order to get to sleep, you may consider playing some quiet and relaxing music in their bedroom to help them switch off. Another possibility is a white noise machine, which produces relaxing sounds such as wind blowing through trees or waterfalls. As well as initiating relaxation, they can help to mask sounds such as coughing or snoring which could potentially irritate one sibling and keep them awake. A night light could be a wise investment, too, if both kids are agreeable. 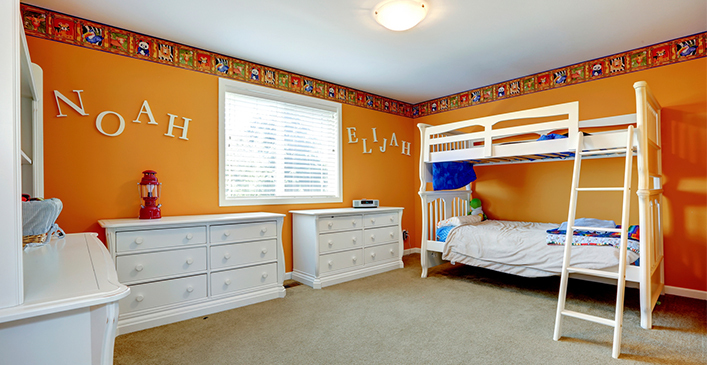 Again, sharing a room can be a valuable bonding experience for kids. As a parent you just need to help them through the rough patches that may arise, especially at first.